Read the full 2018 half-year report in PDF here. Loudspring will focus on long-term profitable growth and has set initial financial targets for its two subsidiaries. Previously communicated targets regarding exits, IPOs and other statements regarding the future no longer apply. Loudspring does not report consolidated accounts. Loudspring is regarded as minor group in accordance with Finnish Accounting Act and hence only reports parent company-level (Oyj) accounts. Loudspring is an industrial group focused on saving natural resources. We own and operate Nordic growth businesses that are making a big environmental impact. We have a diversified business portfolio in order to balance out the fluctuations of individual companies' performance. Our technologies save energy, water and materials in industry, real estate and in everyday life. Our business consists of two branches: Loudspring Industry - majority owned businesses, and Loudspring Ventures - minority ownerships. The name Loudspring stands for a thriving earth swirling with life - a loud spring. It is our mission to stand for our planet and to protect its nature and biodiversity. Our way of protecting the planet is to build and grow scalable businesses that save natural resources. We believe that by doing this the right way, profits and environmental benefits are fully aligned. Solving some of the biggest challenges our planet faces translates into one of the biggest opportunities for growing profitable businesses. Silent Spring - a book that started the global environmental movement - describes what lies ahead if we continue on our path of abusing nature. At Loudspring, we aim for the opposite. In addition to these, there are five incubation holdings in the venture portfolio. 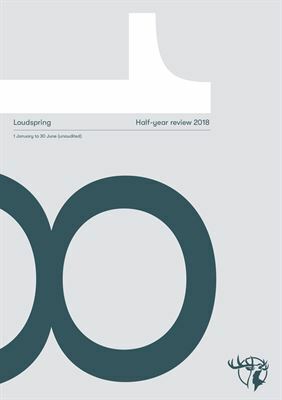 Starting from this report Loudspring has changed its information policy, to provide only audited financials from minority owned associated companies. Half and full year unaudited estimates are reported for Loudspring subsidiaries only. Ownership is reported as effective fully diluted except for Enersize, where effective ownership is reported due to Enersize being a listed company. Effective ownership takes into account both direct and indirect ownership in the portfolio firms. Loudspring has indirect ownership through the Clean Future Fund (CFF), a Finnish limited partnership and several Cleantech Invest SPVs, all of them Swedish holding companies founded by Loudspring. Exit and dividend proceeds from portfolio companies may differ from ownership percentages, both in positive or negative direction, due to different share classes and provisions in shareholder agreements. Loudspring companies are serving some of the largest global companies, making big efficiency improvements where it matters most. Please see below examples of how we are helping our customers save natural resources in several market segments. The comments on associated companies are not full descriptions of each of the associated companies’ situations or their risks. In describing associated company developments, Loudspring relies on management reports of associated companies. As a general rule, Loudspring releases news regarding associated companies only after the associated company releases the news itself or approves the news for release. Furthermore, in minority owned companies, Loudspring is not in a controlling position and information Loudspring receives is limited to each company’s selected communication to its shareholders, which may also be influenced by confidentiality and competition issues. Most Loudspring companies developed positively during the reporting period. Eagle Filters, Nuuka Solutions and ResQ Club in particular made very good progress: Eagle Filters is steadily attracting new customers globally; Nuuka Solutions won large deals with high profile customers; and ResQ Club has continued rapid growth. Nocart has experienced delays in its large projects as well as related cash constraints. Swap.com has significantly reduced costs and streamlined its operations during H1, which is expected to reduce the pace of growth but at the same time reduce time to profitability. Loudspring signed an agreement with Nordea to increase its limit for debt facilities to 2,5 million €. The debt facilities consist of a limit and a long-term debt. The revenue for Loudspring subsidiaries Eagle Filters and Nuuka Solutions have been growing steadily. The graph illustrates Loudspring’s portion of the estimated (non-audited) revenue with the current effective ownership of 67,6% in Eagle Filters and 47,9% in Nuuka Solutions. The estimated (non-audited) combined revenue for Loudspring subsidiaries, weighted with effective ownership is 1,0 MEUR for 1.1.2018 - 30.6.2018. The audited combined revenue of subsidiaries and core holdings, weighted with Loudspring effective ownership 30.6.2018 was 8,2 MEUR in 2017 (80 % growth from 2016). Revenue is highly dependent on Nocart and for the most part, 2017 its revenue is in receivables. Nuuka connects building intelligence systems into one common platform, enabling greatly improved energy efficiency and indoor air quality, as well as streamlined operation and reporting. The Nuuka platform is hardware-independent, making it extremely flexible and future-proof. Nuuka has over 1000 buildings connected to its cloud. Customers include large building asset managers, multinational corporations and cities. Nuuka has recently won several high profile projects in Europe and USA, and is in a position to expand rapidly. Loudspring has a right to over 50% ownership in Nuuka through an add-on investment. Nuuka has continued its growth during the reporting period. Nuuka’s Monthly Recurring Revenue (MRR) order intake number has more than tripled in the first half of the year. Nuuka’s most significant deals include: the Unilever HQ building in the USA; OVG in The Netherlands; a deal with the ICA Real Estate in Sweden; and a deal with the City of Helsinki, to install Nuuka in approximately 1000 city-owned buildings. Nuuka is developing its software continuously, introducing several new integrations and features. Smart building markets are in a significant growth stage. Nuuka is strengthening its position in the Benelux, which it sees as one of the leading markets globally in the smart buildings space. Also the Nordics and parts of the USA are seen as key growth markets for Nuuka´s offering. Competition is increasing, with several large software players as well as start-ups currently entering the smart building market. We welcome this competition as a sign of a growing market. Operating as an integral part of Loudspring Group will be an additional benefit for Nuuka in the real estate market going forward. Nuuka is a subsidiary of Loudspring. Loudspring has the right to increase its ownership in Nuuka to over 50%. Eagle Filters has developed and patented a high performance air filtration solution for gas turbines, which significantly increases the efficiency of gas turbines. Eagle’s solution increases annual output up to 6% and improves overall fuel efficiency by up to 3%. The potential impact for the global energy industry is significant, as over 20% of world electricity is produced with natural gas. Eagle’s technology has been tested and verified by some of the world’s largest energy utilities, and global sales are now ramping up. Eagle’s business model translates into high-margin recurring revenue, and the business has a potential to be highly profitable. Loudspring has acquired options to increase its ownership in Eagle to 80%. Eagle’s revenue H1 2018 was 1,14 MEUR (unaudited estimate). During the reporting period, Eagle received orders from new customers as well as repeat orders form existing customers. Sales started very well in Q1 but Q2 was somewhat slower. Some expected deliveries were postponed and recently increased efforts on new customer acquisition do not affect sales yet as the lead times are typically several months. There are a healthy number of open offers and many new RfQ:s and the market outlook remains very positive. Eagle Filters has renewed its European sales strategy and is starting direct sales to the area which has a lot of untapped potential. In H1, Astoria, a power plant providing 15 to 20% of New York City electricity, selected Eagle for all of its four turbines after rigorous testing of Eagle and competing filtration solutions. Eagle hired a new sales director in June and is increasing sales activities especially in Europe and USA. Eagle estimates the market potential for high performance filtration products is $1,65 BUSD annually. There are over 10 000 gas turbines in the world that could apply Eagle’s technology. The potential economic benefits for customers are $7,5 BUSD annually. Currently, approximately 95% of new power plants still use F-level filtration, but utilities are becoming increasingly aware of the benefits of high performance filtration. ResQ Club is about creating zero-food-waste communities. ResQ is an online marketplace that enables restaurants, cafes and grocery stores to sell their surplus food to nearby people who want to save time, money and planet while enjoying quality food. Monthly GMV (products sold over platform) was at the end of the reporting period over 200 000€. During H1 2018, the amount of weekly purchasing consumers doubled, showing the attractiveness and stickiness of the service. During the same period, the company cut operating costs significantly. Also, marketing spend per each new acquired customer decreased significantly. Currently ResQ is concentrating its expansion efforts to the Nordics. The company initiated successful pilots with grocery stores in April 2018 which were welcomed very well by both the partners and users. At the end of the period, over 20 grocery stores were already using ResQ. The new rescued groceries offering covers ready-made bags and individual products. Enersize provides energy efficiency cloud analytics for heavy industry. The company is listed in Nasdaq First North Stockholm. With Enersize’s technology, large industrial factories can save up to several million € annually in their compressed air system electricity costs. As a Nasdaq First North listed company, Enersize reports independently on its developments. Enersize reported an estimated, non-audited revenue of 183 932€ for H1/2018. measuring, analyzing and improving the efficiency of the compressed air system at Dürr factory campus in Bietigheim-Bissingen, Germany. Enersize recruited VP of Operations, China and a project leader for Enersize’s operations in China. Both will be based in Shanghai. In addition, Enersize presented a new outlook for the current sales pipeline in the Chinese market. At the end of March news about Enersize having a technological breakthrough were published. The technological advancement have lead to two patent applications and have had a significant impact on Enersize’s strategic position. Both patent applications have been filed in China and Sweden. Enersize announced in March that with the new technology breakthrough and patent filings changes to the company strategy, business model and growth strategy will change towards a focus on growth through licensing. Enersize will be able to offer the new technology on a licensing basis to both new and existing customers. Enersize signed a 4-year profit sharing contract with Foton & Cummins in April. The profit sharing contract has been signed as a continuance for an existing installation agreement with Beijing Foton Cummins. For full info on Enersize’s progress, please see Enersize 2018 H1 report that is available for download from the Enersize homepage. During the reporting period, a new project delivery agreement was signed for power plant water reuse in Finland. Sofi FIltration has also made successful tests for marine SOx scrubber water filtration, a successful demonstration in oil & gas industry in the US as well as a successful pilot for a plastics manufacturing plant. The marine SOx scrubber application is a promising area, as regulation such as the IMO 2020 for SOx emissions are increasing interest for marine scrubbers. Nocart provides turn-key renewable power plants in the developing world. Nocart’s power management technology turns different renewable energy sources into good quality electricity. Nocart has experienced delays in its large projects, which are subject to notable inherent risks. The slow realization of receivables has had a direct impact on the company’s cash flow. For the most part, 2017 of the company’s revenue is in receivables. During H1 Nocart has secured additional funding, however, Nocart still requires and is negotiating, further funding with investors to bridge payments from ongoing projects. Currently the majority of the company’s business is coming from big projects in Africa and Asia. Nocart is also working on smaller deliveries and projects where contracts are being finalized. With these smaller projects Nocart is striving to move away from relying solely on big, single projects. During H1, Swap.com made updates to its business model. After significant top line growth in the previous three years the company shifted its focus to margins and reaching profitability. As a result there were necessary layoffs and item adding was reduced as inventory reached 2.3M unique items. The company has been steadily increasing inventory turnover in part by focusing on inventory quality. Operational costs were reduced significantly, and product focus was shifted towards higher margin products with higher customer demand resulting in faster turnaround. Swap.com closed a new funding round with current investors. The equity investment will be completed in tranches and totals appx. 4,5 million €. Incubation holdings (venture holdings that are not deemed core holdings by Loudspring) will be commented upon only if significant development take place. PlugSurfing GmbH was acquired by Fortum. The contract value was not disclosed. Loudspring owned 3.3% of PlugSurfing before the sale. The transaction returned the invested capital and yielded approximately 18% annual return on top of it during the time the company was in the Loudspring portfolio. Oricane (Swedish AB) was written down, and Loudspring no longer has financial expectations from the company. The company's revenue for the review period 1 January to 30 June 2018 was 22 kEUR (1-6/2017: 18 kEUR). Personnel costs during the review period 1 January to 30 June 2018 amounted to 335 (208) kEUR. Other operating expenses in the review period 1 January to 30 June 2018 were a total of 352 (296) kEUR. Higher costs are mainly due to increased personnel and travel expenses. Depreciation, amortization and write-downs of intangible and tangible assets in the review period 1 January to 30 June 2018 was a total of 89 (89) kEUR. The company's operating loss for the review period 1 January to 30 June 2018 was 825 (617) kEUR.The increase in the operating loss was mainly due to higher operational costs. Financial income in the review period 1 January to 30 June 2018 was a total of 56 (147) kEUR, financial expenses a total of 259 (EUR 182) kEUR. The financial expenses were mostly due to a write down in Oricane, a bank loan arrangement fee and currency fluxuations. Financial income was mainly return on capital from exit proceeds. The net loss of the review period 1 January to 30 June 2018 was 1 029 (653) kEUR. The increased loss was mainly due to increased expenses and financial expenses including the write-down in Oricane. At the end of the review period, the balance sheet total stood at 23,698 (23,894) kEUR. The decrease is mainly due to the write down of Oricane and a change in the revaluation reserve due to a decrease in the valuation of Enersize. The shareholders’ equity was 21,103 (21,704) kEUR and the equity ratio was 88,7% (90,8%). The total current liabilities at the beginning of the review period was 623 kEUR and 1 152 kEUR at the end of the review period. The change in the total current liabilities are mainly due to a bank loan from Nordea and an increase in other current liabilities. Eagle Filters Oy: Loudspring made two additional investments in Eagle Filters, first increasing ownership from 34% to 63,4%, followed by another investment to increase ownership to 67,6%. Loudspring still has the option to further increase ownership to 80%. In addition, Loudspring has participated in the funding of Swap and Nocart in the form of loans and has a right to increase ownership through conversion of the loans. Lassi Noponen, Loudspring’s former chairman of the board, was appointed Managing Director and continued as a member of the board. Alexander Lidgren, who acted as the Managing Director of the company until May left Loudsprings’ service. Tarja Teppo who acted as CFO of the company left Loudsprings’ service with Timo Linnainmaa taking over the position as CFO. Thomas Bengtsson, former member of the board took over the position as Chairman of the Board. Antonio Gallizio was appointed Chief Investment Officer. Alf-Oskar Witting was appointed Junior Controller to assist with financial management and investor relations. Joshua Burguete-Kirkman continued as Communications Director. At the end of the review period Loudspring employed 6 persons including Thomas Bengtsson who assists with the operational management of Loudspring in addition to acting Chairman of the Board. Previous members of the board Gudrun Giddings and Peter Carlsson left the board at the AGM 20th of April. At the end of the review period the board of directors consisted of Thomas Bengtsson (Chairman), Lassi Noponen, James Penney and Matti Vuoria. The Annual General Meeting (AGM) of Loudspring was held on the 20th of April 2018 in Helsinki. The AGM resolved that four members be elected to the Board of Directors and re-elected the current members of the Board of Directors Mr. Lassi Noponen, Mr. Thomas Bengtsson Mr. Matti Vuoria and Mr. James Penney. The AGM authorized the Board of Directors to decide on the issuance of class A shares in total amount to a maximum of 5,000,000 shares. This authorization canceled the previous dated 21 April 2017 on the issuance of shares. In addition, the AGM authorized the Board of Directors to decide, in one or more transactions, on the issuance of options. The number of new class A shares that can be subscribed to based on these options may in total amount to a maximum of 1,200,000 shares and may be issued to the key personnel, including members of the Board of Directors of the company, and to cooperation partners and advisors of the company as part of the company's incentive scheme. This authorization canceled the previous dated 21 April 2017 issuance of options. The AGM also authorized the Board of Directors to decide on acquisition of maximum of 1,204,000 company's own class A shares. Loudspring continues to focus on international growth of our businesses. At the same time, securing needed funding and achieving profitability will take a bigger role in our target setting. As we have shifted focus on building Loudsping as an industrial group, our previously communicated targets regarding exits, IPOs and other statements regarding the future no longer apply. We will consider potential exit routes for our companies when we see the right timing and opportunity, but our aim will be to achieve profitable growth. Loudspring will aim to continue increasing ownership in selected companies, consolidate Loudspring Industry, and build some of the current portfolio companies into larger industrial companies. We will focus our own efforts on companies where we can have control and where we see the most value. We will also focus on finding the right talent to support the growth of our companies. Loudspring has several potential high performers in our business portfolio. For most firms the future outlook has continued to be very positive and several of our firms have increased their ambition level. The growing global demand for many of Loudspring’s solutions provides the basis for continued growth into the foreseeable future and we expect many of our companies to continue achieving good results. We aim to make steady progress in continued growth, strengthening organizations, overall professionalism and setting and achieving clear targets. Loudspring is evolving rapidly, but one thing will remain: our mission of saving the earth’s natural resources by growing companies. After the reporting period Nuuka signed a new agreement with ICA Real Estate to install their technology in a further 50+ buildings. It was announced in January that ICA Real Estate would use Nuuka’s software in pilot-projects to monitor, analyze and improve the efficiency of a few of their assets https://www.icafastigheter.se/nyheter/digital-innovation/ .The ultimate goal of the co-operation was to evaluate how ICA Real Estate could maintain their properties even more efficiently and sustainable. ICA Real Estate wants to create the best shopping experience for their customers and at the same time provide a great workplace for their employees through digitalization. After the reporting period, Nocart confirmed a 35 MW waste-to-energy plant deal in Kenya. Nocart had previously signed a sales contract for the delivery of a waste-to-energy plant but the advancement of the project has been awaiting completion of the buyer’s permitting processes and PPA-contract process. The purchase price of the plant is 62 MEUR. In addition, Nocart is involved in the project as a co-owner (35%) of the founded IPP (Independent Power Producer) power plant company. The IPP company has a 20-year contract for selling electricity to Kenya’s national grid. General risks concerning the business environment of Loudspring Plc are related to macroeconomic and capital market uncertainty. The associate companies of Loudspring are start-up and growth companies, and there are remarkable risks involved both in their business operations and through investments in them. It is uncertain that Loudspring is able to sell its holdings in associate companies in a profitable way or that the sale is possible in a planned schedule in line with the company’s strategy. Due to the nature of Loudspring’s business environment, success of acquiring finance for associate companies is of utmost importance. The risks related to the company’s business have been described in detail in the listing prospectus dated 2 May 2014, which can be found (in Finnish language only) on the company’s website (http://frantic.s3.amazonaws.com/cleantechinvest/2014/05/Cleantech-Invest-Oyj_listautumisesite.pdf). The investor memorandum for First North Stockholm listing dated February 2016 contains an overview of the risks related to the company’s business (in Swedish language only). The investor memorandum can be accessed via the company’s website (http://www.loudspring.earth/files/Memo-Cleantech-Invest_Oyj_febr_2016.pdf). An update to the memorandum was made in September 2016 which can be found here (http://www.loudspring.earth/files/Supplement_to_the_company_description_of_April_2016_released_9.9.2016.pdf). There are no major changes in the risks and uncertainties since the date of Stockholm listing prospectus. Some of the associate companies have not reached their targets as to financing, operations and customers and it should be noted that some rely on successfully acquiring more funding within a short time period in order to continue operations. Loudspring Oyj Q3/2018 quarterly summary, which is not a financial performance report or a fully comprehensive report of all events, will be published 31.10.2018. The 2019 financial information release schedule will be published by the end of 2018. Loudspring board members and management team owned on June 30th 2018 in total 2,252,138 class K-shares, 805,402 class A-shares, options that give a right to subscribe 1,209,749 class K-shares and options that give a right to subscribe 336,000 class A-options, taking into account all stock and options that the persons own directly and indirectly through companies controlled or influenced by them or through their family members. The shares represent approximately 12,7% of the company’s total issued and outstanding shares registered on the 30.6.2018 in the trade register and 41,3% of the voting rights of the shares. Loudspring had 5612 registered shareholders according to the share register on June 30th 2018. Euroclear Finland had 3934 shareholders and Euroclear Sweden 1678 shareholders. On the 18th of January a share swap with Eagle Filters took place, increasing Loudspring class-A shares by 128,788. At the end of the review period the total amount of Loudspring shares was 24,074,105, divided into 4,569,031 K shares and 19,505,074 A shares. At the end of the review period Louspring A-series share was listed both in First North Helsinki and Stockholm. Loudspring’s market value at the end of the review period was 28,477,408 EUR. When non-listed K-shares are taken into account and the A-share price in Helsinki First North Exchange at the end of the review period is used, the market value at the end of the period was 35,148,193 EUR. The closing price in First North Helsinki on June 30th 2018 was 1,46€ per share. During the review period the highest price in FN Helsinki was 2,65€, the lowest 1,20 €, and the average 1,80 € per share. The Series A share has a liquidity provision agreement with Pareto Securities that fulfills the NASDAQ OMX Stockholm Oy Liquidity Providing (LP) requirements. Loudspring Series A share trading First North Helsinki is not covered by the liquidity provision agreement.